I am slowly starting to decorate for spring and wanted to share with you the tutorial on how I made this Easter display using branches and Easter egg ornaments. Once you've removed the leaves off of the branches, take all of them and tie them up so you can easily spray paint the branches. I used our tree in the backyard and made sure that there was nothing nearby that I would accidentally spraypaint! Let the branches dry overnight (or whatever the spray can directions instruct). Once the branches are dry, you can go ahead and put the branches in your vase. And now you have a cute Easter Egg Ornament Display! I hope to have more spring decor up in a few weeks, and will make sure to share with you soon! 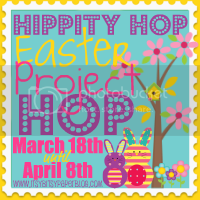 i am gearing to do an easter egg tree too! will post soon! your's look lovely! LOVE the glitter on them! The egg display looks great! I would love for you to link up at my party going on now at Jillify It! Thanks so much for linking up to my Tuesday party at Jillify It! Hope to see you again on Tuesday!